Once someone plans to start living abroad, Spain easily comes to his or her mind. The pleasant weather conditions, the amazing landscape, the charm of the people, the delicious Mediterranian food… It all makes it inevitable for Spain to be an attractive country for foreigners. Nevertheless, Spain, like any other country, has something that no immigrant enjoys: taxes. But which are the taxes that you must pay if you start living in Spain? Well, this blog post is intended to answer that question. We will dive into which are the taxes in Spain for expats during this 2019. First of all, we should consider the time period corresponding to the taxation year in Spain. Unlike many countries, the Spanish tax season goes from January to December, corresponding to a natural calendar year. When, then, should you pay? You must make sure that your taxes from one year are filed between the 1st of May and the 30th of June of the next year. In order to realize that payment, you will need to be tax-identified. This means, you will need your NIE number. All the tax-related issues in Spain, both for residents and non-residents, are regulated by the Spanish Tax Agency, the institution to which you need to pay your taxes. If you want to stay in touch with the latest updates in this field, visiting their site is highly recommended, they frequently upload the last updates to the tax regulation. IMPORTANT DISTINCTION: ARE YOU A TAX RESIDENT IN SPAIN OR NOT? In order to exactly determine which concrete taxes you will pay in Spain and at which exact rate, you must first know if you are a tax resident or not. This distinction has a fiscal character and has nothing to do with the residency permit you possess in order to live legally in the country. This means, you may have or may have not obtained a formal residency permit, but if you meet the requirements, you will anyhow be considered a resident for tax purposes. Then, how do I know if I am a tax resident in Spain? You live in Spain more than 183 days per calendar year (note that the days don’t need to be consecutive in order to count). 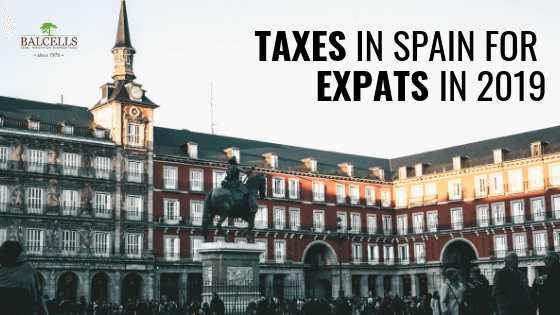 WHICH ARE EXACTLY THE TAXES IN SPAIN PAID BY EXPATS? First of all, what can be considered as an income for the income tax payment? Salaries obtained as an employee and what you gain as a self-employed through your invoices; capital gains that come, for example, from dividends; and pension contributions and benefits. If you are regarded as a Spanish tax resident, you need to pay income tax for your income and gains worldwide. And what happens if you are not considered a tax resident? Well, then good news for you: you will just need to pay income tax on the incomes you have generated in Spain, that’s it. And with a fixed tax rate of 25% on the gross income (not like with the income tax for residents, which is progressive as we will see in a moment). It is the so-called non-resident tax in Spain. Let’s suppose, for example, that you live in the UK but have a property in Spain. Then you will just be taxed by all the incomes that you generate by renting the property. The bad news is that you cannot deduct any expense in this scenario. But let’s go back with the tax resident situation. How much should you exactly pay? Below the first 12.450€ you gain, you will pay 19% on income tax. From 12.450€ to 20.200€, you will owe the Spanish Tax Agency a 24%. From 20.200€ to 35.200€, 30%. From 35.200€ to 60.000€, 37%. And from and above 60.000€ on, 45%. Contrary to the case of non-residents, in this case, you can have deductions and personal allowances. As we are talking about particular cases and there is no general advice, we suggest you contact our tax lawyers so we can provide personalized assistance by helping you optimize your taxes. As a foreigner worker, you will need to contribute to the Spanish social security system, unless you receive a certificate of coverage from your home country. A big difference stemming from tax non-residency and residency arise here, because social security contributions are deductible for residents but not for non-residents. Do you dislike the progressive tax rates that we have in Spain? Well, then you will really enjoy the application of the Beckham Law. How can you benefit from this law? If you are an expatriate who starts living in Spain, you will be able to save money with the Beckham Law, as it will allow you to pay just a flat rate of 25% on your incomes, never going higher than that. This means that you will be considered as a non-resident for tax purposes. Which are the conditions that you need to fulfil in order to be eligible for this rule? The most important thing is that you must not have resided in Spain during the 10 years prior to the application process for this tax exemption. Furthermore, you will need to have a job contract, and the work must be performed in the Spanish territory (although there are certain flexibilities). Do you own a property in Spain? Then you will need to pay the wealth tax in Spain, no matter if you are considered a tax resident or not. And we are not just talking about properties or assets in Spain, the wealth tax applies for assets worldwide. But don’t get scared: this tax is only applicable to highly valued assets. This means you have a personal allowance of 700.000€. Besides, if we are talking about your own property, you have an extra allowance of 300.000€. If you possess assets of a lower value than that, you will not have to worry about the Spanish wealth tax. But let’s suppose you do. For example, it is the case that you own a property valued at 1,5M€. How much should you pay then? The wealth tax ranges from 0,2% to 2,5%. Again, we are in front of a progressive tax: the higher the value of your assets, the higher the tax rate will be. You must take these percentages just as a general rule because depending on the region you are living they can be higher. There are two main ways in which you can reduce the total amount of money you should pay in terms of the Spanish wealth tax. First of all, even though they are not many, certain assets can be excluded from this tax. Secondly, by restructuring your investments, you can reduce the applicable percentage. If you would like to exactly determine how to reduce the total amount you pay thus saving money, do not hesitate to contact us, as this may be a really specific issue we should cover carefully. If you are from the UK you will probably know this tax by the name Inheritance tax. When should you pay this tax? This tax is paid by the individual that accepts any given asset (the beneficiary) conceded as an inheritance. Applying the basic theory to the taxes that an expat must pay while living in Spain, we should consider two situations in which this tax will be due. First of all, if the asset is in Spain, regardless of where does the beneficiary live, she or he will need to pay the Spanish succession tax. Furthermore, the contrary situation also holds; in which if the beneficiary is living in Spain, regardless of where the asset is held, the inheritance tax will also be paid. The exact amount will depend, again, on the region and municipality in which you are based. This means that you won’t pay the same in Catalonia in Andalucia. And what happens if you sell a property or shares of a company and you make money out of it? Well, again, taxes. If you are a non-resident in Spain, you will need to pay between 19 to 23% in terms of taxes applied to the selling price (of the property or shares). Can you deduct anything from the price? Well, if you are a resident, yes you can: you can several concepts to be deducted here. Bad news if you are not, because non-residents can just deduct the expenses from the lawyer, the notary and the agency. Now you exactly know which are the different taxes paid in Spain by expats on this 2019. As you can see, there are several differences stemming from the fact of being tax resident or not, and many ways to optimize the total amount paid. That is why we highly advise you to rely on the help of expert tax lawyers, like the one our team provides. What are the specific tax rates and income amounts for the wealth tax in Cataluna? I only see the range here. In Cataluña the rate ranges from 0ñ21% to 2.75%. As there are many deductions and bonifications, we would really recommend you to contact us at info@balcellsgroup.com so we can analyze your case carefully and help you optimize your taxes. Do I have Capital Gains Tax obligations here in Spain for the sale of my former home in the UK and if so how is it calculated? Usually, Spanish tax residents do not have to pay capital gains tax for the incomes they obtain worldwide. Nevertheless, if you are a non-resident, you should only pay for the property if it was in Spain, but that does not apply to your case. As a resident you need to pay taxes on the worldwide income you generate, in this case, your home in the UK. Nevertheless, we are talking about a progressive tax in which you can also apply bonifications, therefore if you would like to know the exact amount you will end up paying we would really appreciate if you could send us an email at info@balcellsgroup.com. You won’t pay any taxes on the money you have on your account. Hope we have answered your question, for any other doubt do not hesitate to contact us!